I’m sure I’m not the only one who is too familiar with the feeling of taking a deep breath and then wondering where it all went. There’s a reason the exhale is so much more satisfying. The exhale is where we let it go. When we are too overwhelmed it’s hard to find the sweet goodness of a deep exhale. There’s too much running through our brains to let go of anything. Before a thought can float away, we must be sure it’s time to let it go. But what do you do when there simply isn’t enough space to work through all your thoughts? I have many vices to help with this situation. Writing, running, music, and most of all, adventuring. Something about getting out in the mountains with only what I need, disconnecting from the rest of the world for a bit, and pushing physical (or mental) limits helps me find the space to work things out and let things go. Remember when I told you I wanted to live in a tiny home so I would have more space in my life for adventuring? It worked. I’ve been getting out climbing just about every weekend, even if only for a day trip. When I stop and think about the factors that play into my ability to do this, I feel incredibly reassured in my lifestyle choice. The Tiny is set up so that my gear is super accessible. It takes me less than 30 minutes to pack up the adventuremobile for a weekend trip. That includes Annie’s things too! It takes the same amount of time to unpack. I like to keep my space pretty clean, especially now that every square foot counts. A deep clean of my house, which I try to do about once per week, takes less than an hour. I’ve also been lucky enough to cross paths with an awesome climbing partner who seriously challenges my abilities. Last weekend I lead a 5.7 on gear. I honestly never thought I would lead on gear. It’s scary! What happens in my head when I’m climbing is what allows me to breathe. It refocuses my attention on what’s important. Climbing outside of my comfort zone completely clears my head because I must focus all of my thoughts on the next move. It’s called flow. 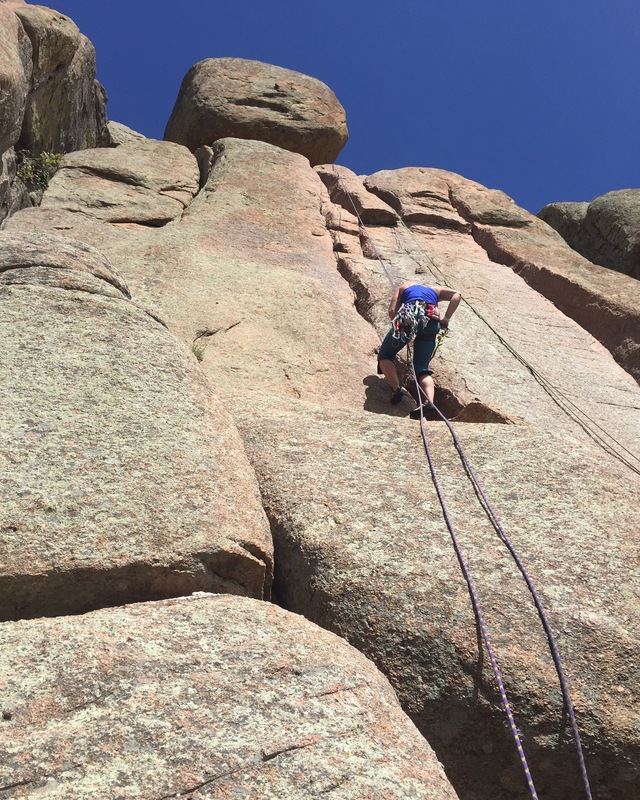 Before I left the ground on my lead, my climbing partner told me to just focus on the climbing. Don’t focus on the gear, don’t think about falling, just focus on the climbing. It’s the best climbing advice I’ve ever heard and potentially useful when applied to other aspects of life as well. Maybe, if I just focus on the next move I need to make, I’ll be able to inhale and exhale. I’m back, and I’ll have more updates for you soon. Thanks for reading!